Shahrukh Khan has kept on juggling roles and pushing himself higher over the years, and in a career which spans almost two and a half decades he has finally emerged as one of the biggest entrepreneurs of the country. It is his image of that of a family man, his frank admission of his success and failures, candid confessions of fears and setbacks that make him a familiar face and household name, says Dr. Anindita Chatterjee in this review of Koral Dasgupta’s Power of A Common Man: Connecting with Consumers the SRK Way (2014). Power of A Common Man: Connecting with Consumers the SRK Way. Constructing an individual as an object of desire. Constructing an individual for mass consumption. Film and sporting stars have always attracted popular attention. ‘Bankable’ stars are highly sought after and excessively well remunerated. 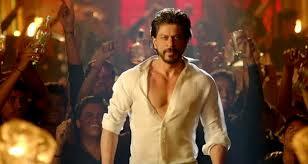 Shahrukh Khan is identified by many as the central icon for the new dynamics of global Bollywood. He is one of its major key players and revenue generators. He has the reputation of holding one of the largest fan-following in the contemporary world of cinema comprising people from diverse places and cultural backgrounds and is perhaps the leading example of what we might call 21st century stardom. Today in India his fan following rivals Beatlemania at its height. He is as much a television star as he is a sports icon, a design clothes horse as much as a brand ambassador. In fact, he embodies the perfect fantasy of the Indian hero. He is ubiquitous in the Indian public sphere. At last count, he was endorsing more than fifty brands, from computers and cars to vegetable oil, facial creams, noodles, and cream biscuits. However, this ubiquity, rather than hurting SRK’s image, helps to make him the quintessential pan-Indian male. Because he is everywhere, for everyone, endorsing every role and every brand, SRK progressively comes to stand for the desires and aspirations of the whole Indian nation. He becomes one of the few symbols that can represent the idea of India in the minds of audiences. Because India is an extremely heterogeneous nation—divided along the lines of language, race, regional communities, religion, class, and caste—pan-Indian symbols such as SRK are especially valuable to the marketing community. 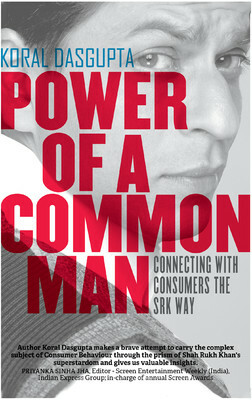 Koral Dasgupta’s book Power of Common Man: Connecting with the Consumers the SRK Way explores the subtle nuances of consumer behavior and how stardom is closely integrated to the world of marketing and advertisement. An academic, management consultant and content editor by profession, Dasgupta is her book analyses the success behind the brand value of ‘Shahrukh Khan’ and what it means to the consumer who ultimately purchases and consumes this image. SRK is a shrewd businessman who knows how to market himself. Dasgupta’s study goes on to investigate the career of this phenomenon called SRK and how it can be seen and analysed in terms of marketing and management studies. To follow SRK is to follow the evolution of India as a nation and the rising desires of the Indian middle class for the commodities and services of the global economy. Having no godfather in the industry, Shahrukh Khan struggled to build his stardom from the scratch, and the consumers are lured by that success story which he spells out in every brand he endorses. The consumers are fascinated by the magic spell cast by him and they want to become a part of it, by using a product endorsed by the King Khan. The book goes on to argue and investigate how ‘It feels as if there is a bit of SRK in every product or services that he endorses! His energy, his romanticism, his success, his business acumen and most importantly the ‘zero’ to ‘hero’ journey—all of these get transported into his endorsements, be it a Tag Heuer watch or a Navratna Oil.’ The brands try to use his ‘guy next door image’ to lure the buyers which is one of the prime reasons behind his paranormal success. It is true that SRK lacks the Greek God like physique that Hrithik Roshan flaunts or the dancing moves of Shahid Kapoor, neither does he experiments with his acting like Amir Khan does, yet he is immensely successful, for he carries a confidence that enhances his brand value. Dasgupta goes on to establish how one of the prime reasons behind SRK’s popularity comes from the fact that the consumers who are the ‘imperfect commoners’ do relate to the confidence that Khan exudes while maintaining that he is ‘perfectly imperfect’ and yet still more successful than others. Since he burst into the limelight with Fauji in 1988, seldom has Shahrukh Khan been away from the headlines yet the fact that he always proclaims his middle class origins, shows how he consciously holds on to his link with the common masses of India. His success story replicates the core of essential India, the fact that though globalisation has brought in its iota of changes yet an Indian is always Indian at heart (Phir Bhi Dil Hai Hindsuthani, as the theme says ). Shahrukh Khan has kept on juggling roles and pushing himself higher over the years, and in a career which spans almost two and a half decades he has finally emerged as one of the biggest entrepreneurs of the country. It is his image of that of a family man, his frank admission of his success and failures, candid confessions of fears and setbacks that make him a familiar face and household name. In a language that is crisp and lucid, Dasgupta’s seminal work chronicles not only the journey of SRK’s rise to fame as an actor after he burst into Bollywood with his negative roles which fascinated the popular imagination of the audience during the early nineties when the Indian social scenario was politically turbulent to his emergence as one of the most successful entrepreneurs of the country. Besides owning a cricket team in the IPL, he has also been named as the brand ambassador for the state of West Bengal in 2012 epitomizing a vision of progress and consistent growth. The book examines the reasons behind his long reign at the top, and how brands have tried to cash on this factor. Dasguptaa avers how despite the obvious comparison how Khan has never tried to emulate or become like Amitabh Bacchan but has tried to maintain his distinctive individuality all along. Dasgupta’s book shows her capacity to think out of the box, and talks about the complex notions of consumer behavior in a way that everyone can understand and relate to. Her study investigates the phenomenon behind the man who can loudly claim ‘I do what I feel like doing. If you like it ‘Thank you’, if you don’t like it ‘stuff it’. Koral Dasgupta’s innovative analysis divided into seventeen chapters brings into life abstract concepts in marketing and consumer behavior, through the lens of SRK’s long and inspiring journey of stardom. This book would certainly appeal to all Shah Rukh Khan fans for it offers plenty of refreshing insights and is provides an interesting read. Beneath its façade of tongue- in -cheek humour and note of fun, the book provides an effective learning, and thereby becomes an important source for cultural studies. Irrespective of the fact whether you are a marketing student, an independent researcher, a business analyst, or just another avid SRK fan it stimulates and excites your thoughts. Dasgupta’s exhaustive work shows how Shahrukh Khan is a part of a consumer society and globalised economy, which is driven by the relentless drive to convert everything and everyone into commodities that can be sold like items in the market. At the end we come to the realisation that consciously or unconsciously we are all a part and parcel of this so-called Shah Rukh Khan myth. Dr. Anindita Chatterjee is Assistant Professor, Department of English, Sanskrit College, Kolkata. Posted in Authors, Book and tagged Amir Khan, Anindita Chatterjee, Bollywood, brand, Dasgupta, India, King Khan, Koral Dasgupta, marketing, Power of A Common Man: Connecting with Consumers the SRK Way, Shah Rukh Khan, Shahrukh Khan, SRK. Bookmark the permalink.